Located about two miles southwest of central Burke, Ryan Chapel (or Ryan's Chapel) sits on a pine covered hill overlooking Pine Valley. The church was founded in 1866 and the cemetery followed two years later. It was the first church in the area, and its cemetery is the burial place for many of area's early residents. The location was picked because of a nearby spring that provided water to the community and was necessary to serve the congregation as well as the horses and mules that pulled their wagons and buggies to the church. Isaac and John Ira Ryan chose the site thinking it was on their land, but it was actually slightly to the north on land owned by L. D. Guinn. Guinn was not a member of the Church, but several years after the Church was founded he deeded two acres to the church without charge. In September, 1865, Isaac and John Ryan and their families settled in the southern part of Angelina County, Texas on a 400-acre tract of land known as " the Old Ryan Field " near Ryan Lake, and the following year, at the dedication of Isaac Ryan's new home, a revival meeting was held. At this meeting, a committee was appointed for selecting a location and erecting a house of worship. The committee included Isaac Ryan, Henry Wright, Francis Crager, Rev. Wiley Weeks, Sr. and Jack Fairchild. and shut. Bro. 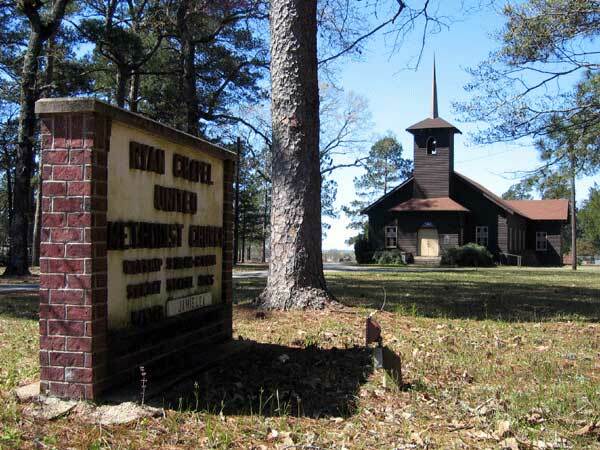 Henry Dawson Wright was appointed by the East Texas Conference as the first pastor of the newly organized Ryan Chapel Methodist Episcopal Church South. There were 19 charter members. The Ryan Chapel has reported to the Annual Conference since its founding in 1866. It was put on the Homer Circuit and for many years shared the circuit's riding preachers from time to time with Redland, Ann's Chapel, Gilliland Chapel, McKendree, Homer, Stanley Creek, Wallace Chapel, Center, and later the Lufkin Methodist Church according to old Conference records. Since this was the only church in the area until 1890, its membership soared to more than 250 persons. From the Chapel's memberships, the Burke, Diboll and Pine Valley Methodist churches were formed. The present building constructed in 1937, is the fourth building to be erected on the same site. The bell that hangs in the church tower was purchased from a Mail Order House in 1907, for $13.60, June 10, 1907, is etched on the bell as the date it was first rung. The bell has summoned the people to church services, peeled out the need for help when a grave was to be dug, and tolled the hour of a funeral. From 1866 until about 1902, when an organ was secured for the church, the song leader had to pitch the hymns. In 1927 and 1928, members of the church raised two cotton crops and used the money to purchase a new piano. A deed was recorded at Homer on April 22, 1874 deeding five acres of land for church and school purposes to the trustees of the Homer Circuit, East Texas Conference, given by L. H. W. Guinn. This included the church and cemetery. The remaining two and a half acres were bought from Dow Columbus Wright, a nephew of Rev. Henry Wright, and his wife Jennie (Franklin) Wright in 1916. In 1964, a state historical marker was placed at Ryan Chapel. 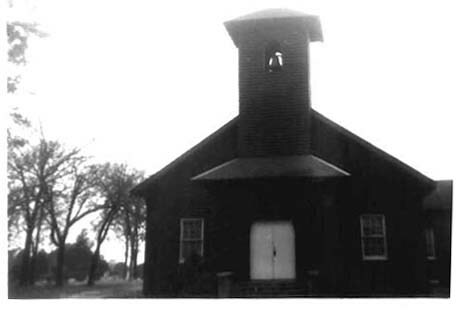 On March 13, 1966, the Chapel observed its 100th anniversary as the oldest Methodist Church in the county with continuing services for as many years. Henry Dawson Wright was the fifth child born to Robert Dawson Wright and Eleanor (Dickerson) Wright, May 3rd, 1829, in DeSirard Bayou, Ouachita Parish, Louisiana, Henry Dawson Wright meet and married Martha Ann Jacks, she was born about 1830 in Louisiana, there was eight children born to Henry Dawson and Martha Ann, the first two was born in Louisiana, the next six was born in Texas, there was five boys and three girls. Henry Dawson moved his family to Texas in 1852 at the time his father Robert Dawson Wright made the move to Sumpter Texas, Henry Dawson Wright settled somewhere around Kirbyville, Newton County, Texas where Christopher Columbus was born on November 23, 1852, and by 1860 he was in Angelina County where he had settled on One Hundred and Sixty acres of vacant public land which was surveyed for him on the 1st. day of May 1861, by G. W. Gann, surveyor of Angelina County. Henry Dawson Wright and his wife Martha Ann (Jacks) Wright are both buried at Ryan's Chapel Cemetery in Burke, Angelina County, Texas, Martha Ann was the first to pass away in 1870, and in 1877, Henry Dawson was placed alone side his beloved wife in Ryan's Chapel Cemetery, his sons Christopher Columbus, and John Wesley Wright are also buried at Ryan's Chapel Cemetery, as well as his brother Isaac Alexander Talley Wright.